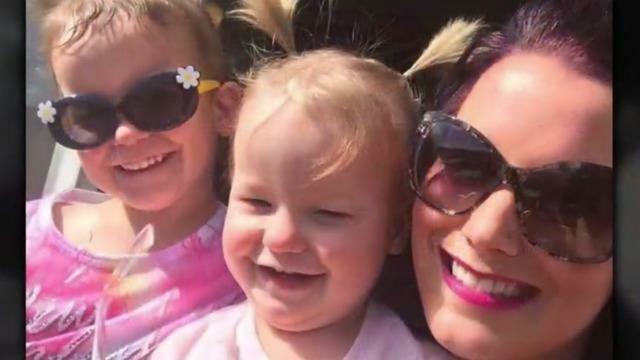 DENVER -- The father charged with murdering his two young daughters, who were found submerged in oil tanks, told authorities his pregnant wife killed the children after learning he wanted a separation, according to court documents. He also said he erupted in rage after witnessing the killings and strangled his wife inside the family's suburban Denver home, according to the documents. Watts first asked to speak with his father, then admitted to killing his wife, Shannan. Watts told police in court papers released Monday that he killed her after witnessing her strangling one of the girls on a baby monitor. He said she had already killed the other child. Christopher Watts, 33, was charged Monday with three counts of first-degree murder, two counts of murdering a child under 12, one count of unlawful termination of a pregnancy and three counts of tampering with a deceased human body. He is scheduled to appear in court on Tuesday and is being held without bail. District Attorney Michael Rourke declined to answer questions about the case Monday but said his office has three prosecutors working on it. When asked if his team would be seeking the death penalty, Rourke said, "It's way too early to make that determination." With Chris Watts' approval, police searched the house and found his wife's cellphone stuffed inside a couch. Her purse was on a kitchen island and a suitcase was at the bottom of the stairs. A detective spoke to Chris Watts and learned about his separation plans. Watts first described the conversation with Shannan as civil but later told police that "they were both upset and crying" and she planned to go to a friend's house that day, the court papers said. It wasn't until Wednesday night that he made his promise to tell police "the truth," and offered an account of the deaths. According to Watts' account, the early hours of Aug. 13 began with an intense conversation. He said he told his wife that he wanted a separation. Separately in the papers released Monday, investigators said they learned that Chris Watts was "actively involved in an affair with a co-worker," something he denied in earlier conversations with police. Watts told police that after discussing the separation he walked downstairs. When he returned, he told them he spotted a baby monitor on his wife's nightstand -- displaying her "actively strangling" their 3-year-old daughter, Celeste. He said the video feed also showed their other daughter, 4-year-old Bella, "sprawled out on her bed and blue." Watts, an operator with Anadarko Petroleum, said he loaded his wife and daughters' bodies into the back seat of his truck and drove to an oil work site about 40 miles east of the family's home. There, he buried Shanann Watts' body and "dumped the girls inside" oil tanks, according to the court document. Watts was arrested last week and charged on Monday. A day before his arrest, Watts issued a televised plea for the return of his wife and daughters. Shanann's father, Frank Rzucek, spoke to reporters for the first time on Monday. "We would like to thank everyone and the Frederick Police Department and all the agencies involved for working so hard to find my daughter, granddaughters and Niko. Thank you everyone for coming out to the candlelight vigil and saying all your prayers. They are greatly appreciated. Keep the prayers coming," Frank Rzucek said. Outside the family's home in Frederick, north of Denver, a memorial of stuffed animals, balloons, flowers and messages continues to grow.